Some more exploring in the foodie haunts of my new city. Jake’s Deli – 401 Washington Avenue – You know how I feel about delis. Jake’s is a gem tucked into the center of Towson, walkable from the post office and several local businesses. After a morning errand, I saw the word “Deli” and immediately craved chicken salad – the standard by which I judge all delis. I was not disappointed! The sandwich was properly priced, huge and quickly made, and packed into a to-go container for me with chips and a pickle. It’s a bit hard to see from the street, but it’s located in the basement of the building it occupies. Burger Bros – 14 Allegheny Avenue – I took my parents to this highly touted* local burger joint a month or two ago, thanks to a Groupon. I will say the prices are higher than average so the Groupon was useful. Dad and I had burgers and Mom opted for a salad. The turkey burger was just right, and the onion rings I ordered were out of this world. The indoor seating is limited, so you may want to take your burger for a walk. Spice & Dice – 1220 East Joppa Road – Thai food was my only refuge in the small Midwestern town that I lived in prior to Baltimore, so it is quite close to my heart. Colleagues and friends order from Spice & Dice all the time and I finally got on board. Their lunch specials Monday through Friday from 11 a.m. to 3 p.m. include a free appetizer and dessert, and start at $7.95. Prepare yourself for HOT if you ask for a spicy dish – they are not messing around! 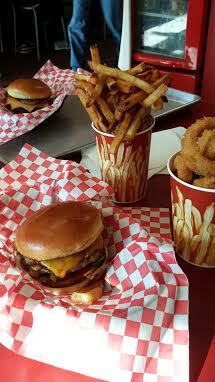 * Burger Bros was rated “Best of Baltimore” in 2008. One thing that I was sorely missing while living in central Illinois was a deli. A market, a sub shop, a luncheonette. Not a grocery store, we had three of those if you count Walmart. I mean a corner market, where you can access lottery tickets, a newspaper and most importantly: the food. The upscale deli is a thing of hipster kingdoms and haute neighborhoods. Exposed brick and wooden beams do not a deli make. Ditto, exorbitant pricing of a fancy sandwich with sprouts or a spread you can’t pronounce. A true deli is an experience. It may or may not have a line out the door (it should) and possibly a “take a number” wheel. It should also be a place to go when you’re not trying to go somewhere. It becomes part of your routine, not a one-time destination. I’m not entirely sure if this phenomenon extends past the East coast where I grew up. Just up the street from my parent’s home is Heights Market. A local institution where we used to get iced cinnamon rolls before school, my dad still gets the paper there on Sunday mornings. It’s small, nothing fancy, a maximum of four aisles. The odds we’ll see someone we know are 8 out of 10. They get fresh rolls from a local bakery, and keep them on the counter top in tall plastic cases, with the plastic tongs to go surfing for the one that looks just right. A massive selection of brightly labeled chips (Utz, obviously) mirror A-treat 2 liters and other sugary sweet beverages that I call SODA, not pop. The baking spices are twice the price. The meat case is full of local beef from Koehler’s farm**. And then, there’s the deli counter. Enclosed in glass and under lights, is a large variety of comfort food. Some people call them cold-cuts, others call it lunch-meat, whatever it is if it’s a real deli the selection should be vast. Ham and turkey and roast beef by the pound. Several kinds of cheese with salt content so high it could seize your heart. Tuna salad, egg salad, chicken salad, what-is-there-besides-mayo salad. Bright pink signs a shade more neon than the pickled beets shout out the prepared foods that you simply must have for dinner: stuffed peppers, baked macaroni and cheese, swedish meatballs. The wall behind the counter boasts the same hard plastic Boarshead sign that’s been there since the dawn of time. A list of daily specials in strident fonts calls for your attention (Meatball Sub Monday!) and a long mirror lines the counter, where you can ask your reflection if you really do need that quarter pound of potato salad (you deserve it). Thin-sliced, thick sliced, that’s just fine-sliced – the butcher and his crew will assemble your plastic-wrapped packages however you like. While you wait, you stare down the hanging columns homemade jerky (you could smell it on the drive in) and consider the heavy barrel full of gigantic deli pickles and the rickety wire stand of Hostess products and fruit pies. Then of course you need a sandwich. A hoagie, a sub, a sandwich, a gyro. If you’ve had a deli sandwich, you’ll likely frown upon any other type of assembled meat and cheese situation. This is the equivalent of going to Taco Bell for a burrito and expecting Chipotle. You’re doing it wrong. A deli sandwich is required to be at least twice the diameter of your mouth, insofar as you will take one bite and the entire thing will fall out the back, which you’ll miss because your eyes are closed for the first bite, like a first kiss. I hope you have a napkin in that brown paper bag. 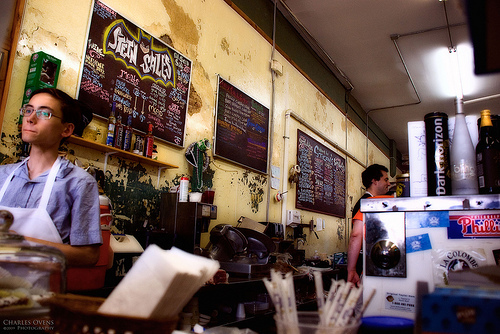 * read more about Stein’s Deli and my NOLA food binge. I love talking about food, eating food, blogging about food, cooking food, baking food and the whole experience of food. Because that’s what good food is to me: an experience. Sometimes it’s atmosphere at a sweet little café tucked into a side street, or a thoughtful waiter at a bustling restaurant. It’s also the laughter of friends fueled by red wine, and the full feeling of heart and appetite at my parent’s dining room table. I’m not a food critic and I don’t go looking for Zagat ratings (although I admit to Yelp-ing and Urban Spoon-ing in a new city). I just like food. One of the best meals ever put to plate in my opinion is breakfast. Growing up my father’s breakfasts were legendary. Friends stayed over and hustled around the kitchen table watching the magic happen: silver dollar pancakes, bacon, eggs, french toast, homefries, an endless array of good smells and good eats. At the time I raised my eyebrows at runny yolks, and now I will gladly skewer a fried egg over a medium burger. I pursed my lips at Hollandaise sauce and other “fancy” deviants at the restaurant table and have since converted to savory treats and curious flavor combinations. Brunch is an event. Even if it only involves two people, there is fanfare. I have a long standing arrangement with several friends to 1) not commit to the same dish, 2) switch plates at the halfway point and 3) combine savory and sweet. This may sound serious .. but this is breakfast. We are not messing around here, people. My most recent off the charts breakfast experience in early November was here in Baltimore at a divine haunt known as Miss Shirley’s Café (three locations). It’s the kind of place with a monster menu and gorgeous twists on breakfast classics. We even ordered an appetizer: Sweet potato biscuits with peach jalapeño jam. 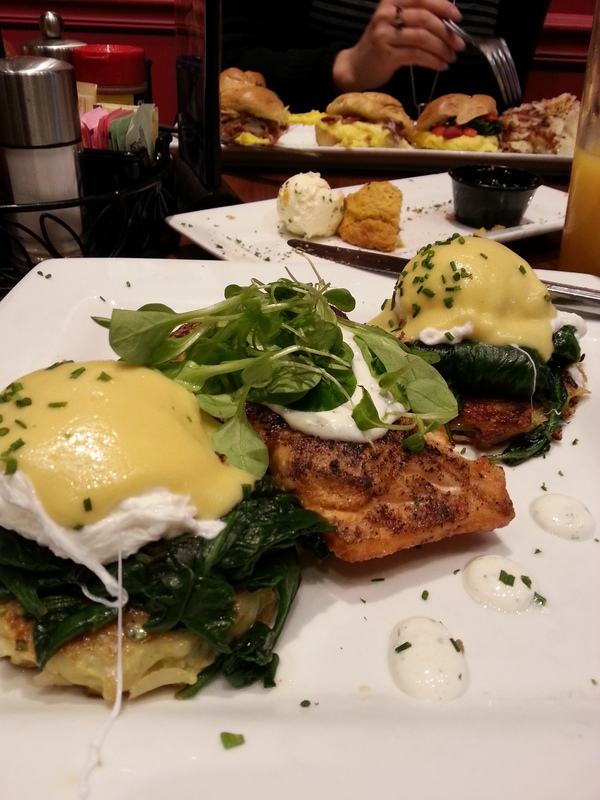 She stole my heart with a “healthy” Grilled Salmon Florentine Benedict .. Poached Eggs & Grilled Salmon, Potato Zucchini Pancakes, Wilted Spinach, Dill Garlic Sour Cream & Herbed Hollandaise Sauce. The result automatically puts her on the above list of memorable eats.. and I’ll continue to search for more. There is nothing more thrilling than a bargain. 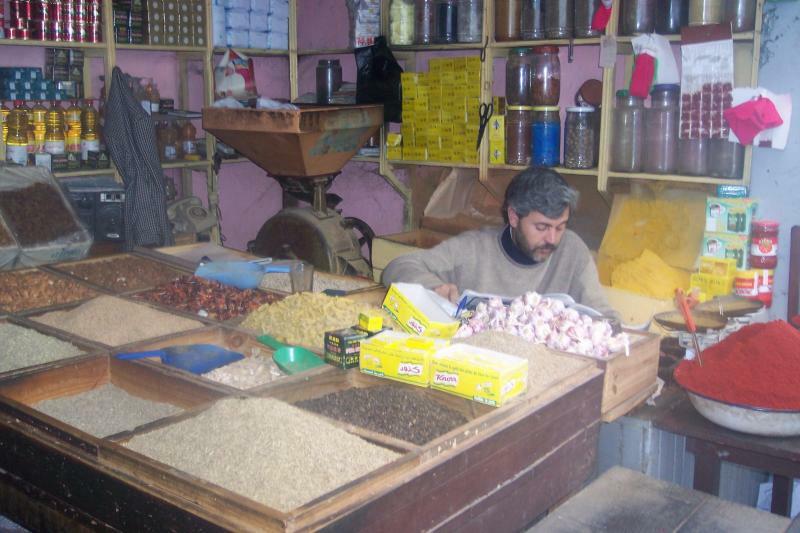 Nothing more colorful than endless rows of rainbow-hued spices. Nothing more satisfying than the taste of something so fresh you know it was harvested that morning. And the smell? Oh … the smell. Something cooking, baking, frying, positively leaping from the pan to your nose. You could say I like markets, but that would be an understatement. 1) Don’t assume a photograph is acceptable; ask. This is also an easy conversation starter. 2) Don’t expect a bargain. Look for local cues – are other people haggling for prices? You may unintentionally insult a shopkeeper if you go in swinging your wallet and hoping for a bargain when the prices are fixed. 3) Don’t forget to say thank you. Those samples you’re stuffing into your mouth are also sold separately. Like what you tasted? Support that vendor, buy some product, and hear their story. 4, 5 & 6) Bring a bag. Watch your wallet. Go with a local if possible. * Grand Bazaar, Istanbul, Turkey. “One of the largest and oldest covered markets in the world, with 61 covered streets and over 3,000 shops,” so says Wikipedia. It’s lesser known cousin is the nearby Egyptian Bazaar or Spice Market. See this post in the Delicious Istanbul blog for local tips on do’s and don’ts. I bargained my face off for a pashmina in the Grand Bazaar, and a local friend helped me secure an evil eye pendant for a good price. * Borough Market, London, England. This one is fresh in my mind, as I’m just off a trip to England & Wales. I had some great conversation with shopkeepers, bread makers, farmers and just some really excellent people. This is a great combination of fresh produce and prepared foods, which explains the outrageous raclette I feasted on in the afternoon. I also managed to fill up a bag with some great snacks for the following day… after sampling the entire market and returning to my favorites. * La Boqueria, Barcelona, Spain. The Spanish know markets. From wandering gypsies to high priced Mercado San Miguel in Madrid, I have always found the same high energy, and love of food. This was one of my first Spanish markets, and I walked in wide-eyed and hungry for more than just photos. You can’t miss the gates off of the central avenue of Las Ramblas. I snapped a few photos here on my first visit, including the great escape of a local lobster (below). * Central Market, Cardiff, Wales. I am particularly drawn to markets housed in their original (if modified) buildings. Central Market has been doing business in one of the Victorian arcades that snake between two main streets (St. Mary’s and Trinity) since 1891. Most fabulous are the Welsh teacakes, and the gigantic upstairs record store that bears my name. * Great Market Hall or Central Market, Budapest, Hungary. My mouth waters when I think about this colorful place, and the langos I had for lunch. As bright as it’s famous paprika spice – this two story covered market is a noisy, delicious space. There is a fair mix of tourists and locals, and plenty of food and souvenirs like the hand-stitched linens, and endless rows of hot peppers. * St. Nicholas Market, Galway, Ireland. After being intensely charmed by the Irish, I was so pleased to wander into Galway after a long stroll along the sea to find this busy market fighting the rain and the cold. Hearty souls selling everything from wool socks to fresh fish were endlessly kind. My personal favorite is the donut maker, who put a freshly fried fasnacht in my hand for a mere 60 cents, after agreeing to my photography (and confirming I was not with the tax folk).